Two skeins of Tilli Tomas Pure and Simple, and one skein of Tilli Tomas Rock Star went home with Anina one day… The next week, a masterpiece appeared in the store! “Sahara” was designed by Wendy Bernard for Stitch Diva Studios. This top has an exquisite and elegant fit. Along with being knit top-down, sizing tips are placed throughout the pattern to help achieve the custom fit that you want. 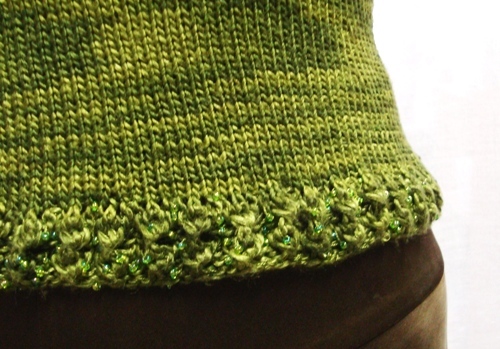 And best yet… no seaming required! Bring on the cheers! Stitch Diva patterns are extremely well laid out. 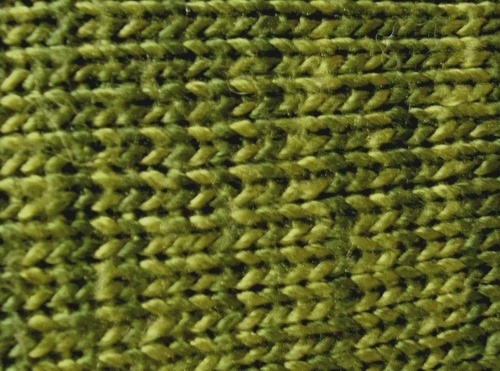 Almost all of the patterns have pictures of project stitches that you will use in your pattern. In this pattern it shows you how to do a provisional cast on, and also shows you different increases that you’ll need to use. 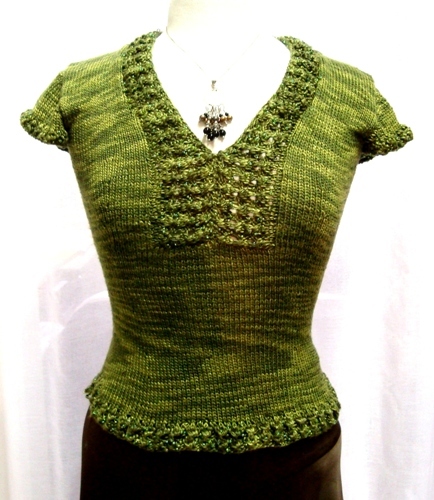 The rich silks that are used for this top are so sumptuous against the skin. The accent embellishment of Rock Star on the neck-line, cuffs and hem really add to the elegant feeling that this top exudes. Anina made the short-sleeved version, but the pattern also gives you the option to make it sleeveless, or with a long dramatic sleeve. This pattern also accommodates for all sizes, ranging from a 31″ to a 53″ bust.For more photos, take a look at Anina’s ravelry page. We’re hoping to have a Sahara class in North Vancouver soon, so be sure to check our class schedule in the next few weeks! Anina’s top is in the front window of our Point Grey store, and Donna’s blue version is now in the North Vancouver store. Drop by and take a look! 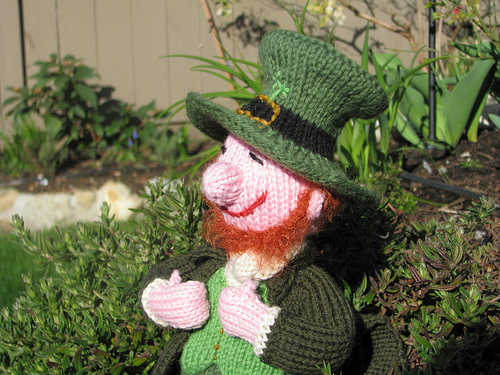 Another project that Anina has just completed is Smiley the Leprechaun. Very appropriate for St. Patrick’s Day today! What a fun project! Smiley is made from Cascade 220. We have loads of great colours in stock! And for all the little bits of colour, come in a take a look at the “Small Balls” from Pick Up Sicks. Made of 100% worsted weight wool, each ball is 65 yards which makes them great for little projects like this one. For more pictures, take a look here. This entry was posted on Wednesday, March 17th, 2010 at 11:09 am	and is filed under Uncategorized. You can follow any responses to this entry through the RSS 2.0 feed. Both comments and pings are currently closed.